Tailor made service - Whatever you need, our vehicle fleet is sure to satisfay it. 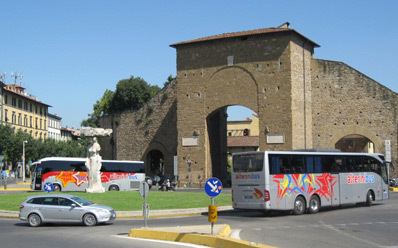 Book our buses for tours, school trips, day trips, shore excursions or for meetings, ceremonies, weddings and events. Because every trip is different we can't publish a list of fixed prices here on the website. All requests are priced individually based upon a number of factors but we will only ever charge you for exactly what you request – nothing more and nothing less. We have no ‘minimum’ hire charge. Our objective is based on accuracy, reliability and affability. Precision and guarantee to journey with every comfort, and availability 24 hours a day by our personnel to satisfy every request. Security - of travelling with modern and comfortable coaches. 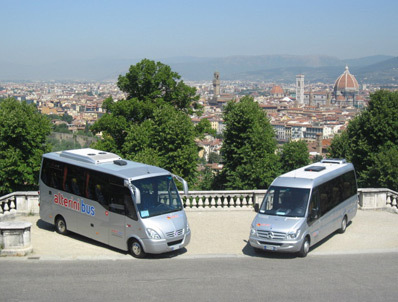 All coaches are insured by UNIPOL-SAI, one of the most reputable companies in Italy. Assurance - to choose among the best that can be offered in our sector. To ensure high standard of quality we use only the latest, most technologically advanced toring coaches, purchased brand new and equipped to our own specifications. Our motor coaches go through frequent maintenance inspections including brake systems, suspension and drive train, a through check of the heating and air conditioning systems, inspection of all tires and a review of oil and air lines. We replace critical parts long before necessary. Each motor coach is inspected regularly in authorized workshops and undergo an annual Ministry of Transport inspection every 12 months. In addition, our drivers fill an important role in the inspection process and trained to inspect the key aspects of their vehicles prior the departing from our facilities. This is one key aspect to our success, surety, and reliability.